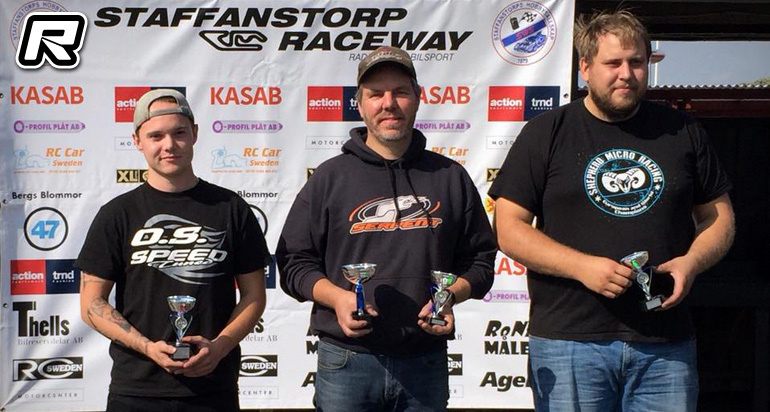 Last weekend round 4 of the Swedish Nitro On-road Championships were held at Staffanstorps Raceway. In the 1/8th class it was Mikael Fransson who set the pace and took the top qualifier spot, while Oliver Olsson lined up 2nd and Stefan Andersson 3rd. At the start of the 45-minute final Serpent racer Mikael Fransson jumped straight into the lead and held that position to the end of the race. Oliver Olsson, driving a Mugen, missed the start having called a 10 minute time delay managed to work his way back from last position to finish in 2nd place 3 laps behind the winner with Shepherd driver Stefan Andersson finishing in 3rd place. Thanks to Mikael Olsson for the update.